Join My Health Blog – It’s Free ! Are Diet Sodas and Artificial Sweeteners Safe? Are Annual Pelvic Exams Still Warranted? Are Saturated Fats Really Bad For Our HEART? BRCA Testing – A Jewish New Year’s Resolution? Can Camels In The Middle East Make You Sick Here? Colon Cancer Is Declining – Is It Time To Celebrate?? Crowded Emergency Departments – Will It Get Worse? Does All Breast Cancer Need To Be Treated? Does Vitamin D Live Up To Its Promise? Dr. Oz Testifies Before Congress – Is Dr T. Next? Maryland Hospitals To Be Paid Differently: Will That Affect Your Care? New Blood Pressure Recommendations – The End of Personalized Medicine? Overweight Physicians – Do we practice what we preach? We All Should Be Taking Aspirin – Right? What Are Trans Fats That The FDA Has Proposed Banning? Who Should Get Hepatitis C Tested? Yoga While Sitting In Your Chair! Click To Watch Our Video – YOU Can Do This! Many consumers express concerns that aspartame, sucralose, and other artificial sweeteners may not be safe, in spite of their being rigorously researched and approved by scientists and governmental agencies the world over. Below, we will review two of the most commonly used types. We’ll omit saccharin now and in any future discussions, due to the fact that most consumers have replaced saccharin with other non-caloric sweeteners because of its bitter aftertaste. 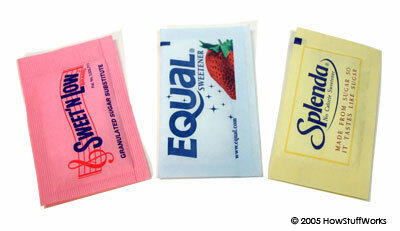 Sucralose (Splenda): A number of studies with animals suggests both possible side effects and side-benefits for humans. These will not be discussed in detail here, given that they have not been shown to occur in humans as of yet. Briefly however, they involve the possibility of changes in gut hormones that increase satiety and cause insulin secretion, and changes in the number and type of bacteria found in the GI tract. One possible exception to the lack of data in humans may be of relevance to cancer patients. Sucralose increases the activity of certain proteins that cause the reduced absorption of chemotherapeutic drugs. These proteins are involved in drug resistance, which can complicate cancer treatment. This is not yet thought to be clinically relevant, just a possibility. Aspartame (Equal, Nutrasweet): As you would expect, all of the studies funded by the industry vouch for its safety, whereas 92% of independently funded studies report that aspartame may cause problems. One of these concerns is the breakdown of aspartame into methanol. This chemical is actually a natural breakdown product of many foods, and a glass of tomato juice provides about 6 times as much methanol as an equivalent amount of diet beverage sweetened with aspartame. Other concerns – including the possibility of cancers, headaches, allergic reactions, and seizures – have, after the publication of carefully designed and controlled studies, not been found to occur. Those persons who swear that sugar substitutes cause them to experience noxious side effects should stay away from these. It’s well known in the field of mind-body medicine (‘psychobiology’) that, although actual biochemical toxicity may not exist, a reaction may still occur. If a person develops a negative reaction (caused perhaps by food poisoning or new onset of allergy) while having a meal in which a sugar substitute is used, that person will develop a mental association between that sweetener and the reaction. This makes it more likely that the same reaction may be caused by future exposure to that sweetener. The bottom line is that the preponderance of evidence to date suggests that these substitutes are safe and we have no hesitation in recommending them to patients seeking help to lose weight. Interested in losing weight? Check out our multidisciplinary weight loss program by clicking here. Our patients are losing an average of 3 pounds a week while eating normal foods and having fun in the process! The following articles were used as material for this blog post. Readers who want to review these may request the full text versions by E-mail. Marinovich M et al, Aspartame, low-calorie sweeteners and disease: Regulatory safety and epidemiological issues. Food and Chemical Toxicology 60 (2013) 109–115. Schiffman SS, Rother KI. Sucralose, A Synthetic Organochlorine Sweetener: Overview of Biological Issues. J Toxicol Environ Health B Crit Rev. Sep 2013; 16(7): 399–451. Tandel KR. Sugar substitutes: Health controversy over perceived benefits. J Pharmacol Pharmacother. 2011 Oct-Dec; 2(4): 236–243. This entry was posted in healthblog by Dr Taubman. Bookmark the permalink.